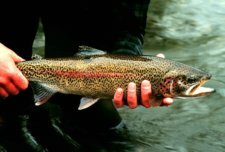 New Jersey has several nice fly fishing trout streams located throughout the state. The Rockaway River, Big Flat Brook and Pequest are all located near large populations which is good for convenience but some times they get a bit crowded. These are your typical trout streams with the riffles, pools and nice runs. There are nice hatches because of the variety of insects living in the trees near the banks of the rivers. You will find a nice supply of fish and many are good size making your fly fishing trip a great experience. This state has some great fly fishing and is worth a visit. Many New York fly fishermen and Pennsylvania fisherman travel here because of the nice streams. Be sure to check out these streams and others in the state. Check out the bottom of this page showing you the location of each stream. The Big Flat Brook is located in Northwest New Jersey and is considered to be one of the best fly-fishing rivers in the state. The river starts near Haneys Mill and travels about 28 miles in a Southwest direction and dumps into the Delaware River near Flatbrookville. There is plenty of good access from routes 615 and 640. Located about 35 miles from New York City, the Rockaway River is a local favorite. It wasn’t always though. It has taken a lot of efforts by many groups to bring the river back to life. The river now has great hatches that provide an abundant supply of fish over its 30-mile stretch. Another great trout stream in Northwest corner of the state, the Pequest is well known for the abundant trout. There is a fish hatchery on the river that adds to the supply of fish. There are many fish to be found on this great stream that average 12” and better. New Jersey fishing regulations and license. New Jersey is a great page to fly fish, click here to choose another state.